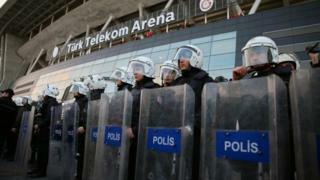 A football match between two of Istanbul's top teams has been postponed for security reasons, Turkish authorities have announced. The game was called off at short notice, a day after a suicide bomber killed four people in the city. The Istanbul governor's office said the decision had been taken "after the evaluation of credible intelligence". The bombing in Istanbul's main shopping street was blamed by the authorities on so-called Islamic State (IS). Fans had already begun to arrive for the Fenerbahce-Galatasaray match at Galatasaray's Turk Telecom Arena when the announcement was made. There were boos as supporters were left with no choice but to leave the ground. The postponement came even though the authorities have repeatedly urged the 15 million inhabitants of Turkey's largest city to carry on with their normal daily lives after the blast. Interior Minister Efken Ala meanwhile named the bomb suspect as Mehmet Ozturk, born in 1992 in Gaziantep. He told reporters that five people had been questioned so far. Mr Ala also announced a review of security measures in seven Turkish provinces following several attacks since July. Three Israelis - two with Israeli-US nationality - and an Iranian were killed by the bomb attack. Another 36 were injured. Eleven Israelis were among the injured. Two Irish citizens, one national each from Germany, Iceland, Dubai and Iran were also injured. The coffins of the Israeli nationals were flown out on Sunday and the Israeli government has now advised its citizens to avoid Turkey. It has been attacked by IS in the past - most recently in January when a suspected suicide attack in Istanbul killed 12 German tourists. And more than 100 people died outside Ankara railway station in October 2015 when IS militants carried out a double bombing close to the headquarters of the national intelligence organisation. Kurdish militants have claimed a number of recent attacks in Turkey. President Recep Tayyip Erdogan has said terror groups are targeting civilians because they are losing their struggle against Turkish security forces. Turkey had in the meantime launched a nationwide tightening of security ahead of the Kurdish spring festival of Newroz on Monday, an occasion traditionally used by Kurds in Turkey to assert their ethnic identity and demand greater rights. Turkey violence: How dangerous is Turkey's instability?